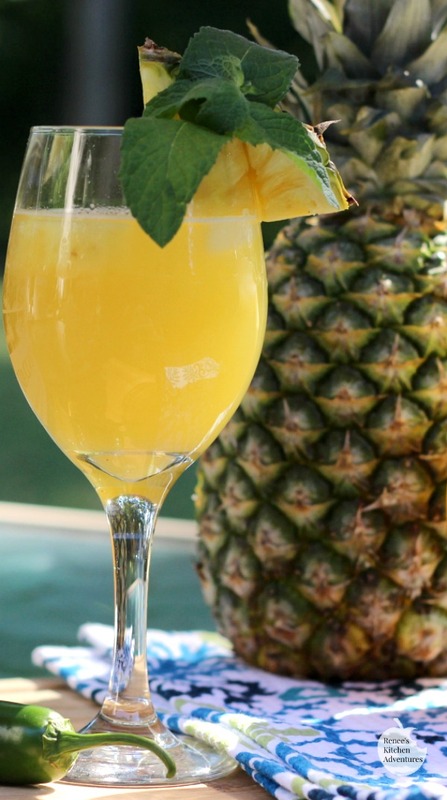 Pineapple-Jalapeno Wine Spritzer is the perfect cocktail to cool off with on a hot, end-of-summer, day! 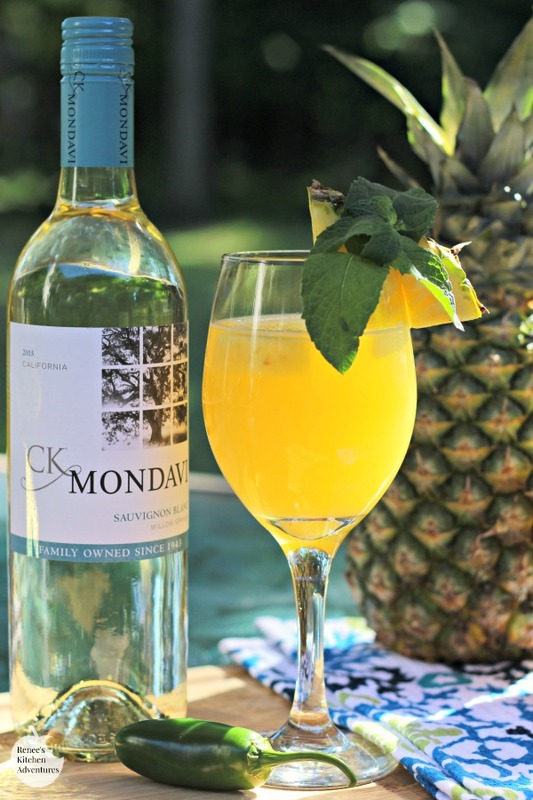 This refreshing beverage made with CK Mondavi Sauvignon Blanc, Pineapple juice, and jalapeno simple syrup is calling your name! I am still in denial that it's August already. Why does the summer slip by so swiftly? But, I guess there is still plenty of time to enjoy this delicious Pineapple-Jalapeno Wine Spritzer before it's gone forever, right? You will LOVE this combination of sweet with a touch of heat in your glass. This spritzer starts with a bottle of CK Mondavi Sauvignon Blanc. This medium-bodied wine makes the perfect base for this beverage. It's bold enough to stand up to the addition of the pineapple and jalapeno flavors, but with it's citrus notes, it blends beautifully with them. 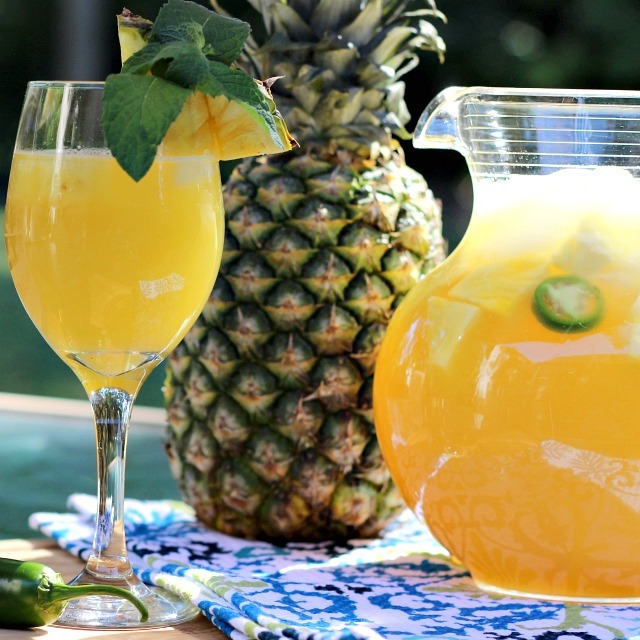 I like to make this beverage in a pitcher and add a little fruit and a few jalapeno slices to finish it with. It's so pretty! It's perfect for entertaining out on the back deck on a warm late summer evening with friends! 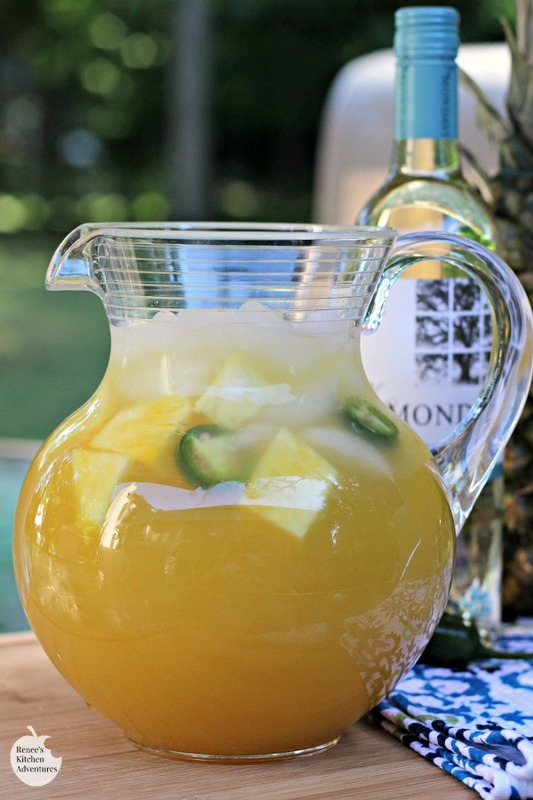 Pineapple-Jalapeno Wine Spritzer is so easy to make. It starts with a simple syrup infused with jalapeno. Once that is cooled, add ice to the pitcher and start adding ingredients. The sweet pineapple is so wonderful with the heat of the jalapeno. Adjust the amount of simple syrup to create the level of heat that appeals to you. Looking for more great cocktail ideas? Click here for more great recipes with wine! Read more about all American made CK Mondavi wines here! A refreshing wine cocktail flavored with sweet heat of pineapple and jalapeno pepper. In small saucepan, combine the sugar, water and sliced jalapeno. Cook over med heat , stirring occasionally, until sugar is completely dissolved. Remove from heat and allow to cool for 10 minutes. Strain out the jalapeno peppers, (reserve a few for garnish later, if desired). Allow mixture to cool completely. To make cocktail: To a two-quart pitcher, add a couple of cups of ice. Add entire bottle of wine, pineapple juice, and soda. Stir to combine. Add a 1/4 cup to a 1/2 cup (depending on desired amount of heat) to pitcher. Stir. Add in pineapple chunks and reserved jalapeno slices, if desired. Serve immediately.